Jacob Sylvester Arney, son of John and Margaret Arney, was born near Urbana, Champaign County, Ohio on March 23, 1839. He came with his parents to Davis County, Iowa, in 1848. He was married March 1, 1860, to Linnie Ann Barnes, and soon after his marriage moved to Randolph county, Mo., where, owing to the unsettled political conditions of the period, he lived but one year, returning to Davis county where he remained until spring, 1864. Into the home thus established came eight children, thre daughters dying in infancy, and one son Ira Rolla, died January 29, 1917. The others - Mary Machlan, and Olive Gardner of Leon, Joseph Arney of Kinsville, Mo., and Otto Arney of Bagley, Minn., survive their father. 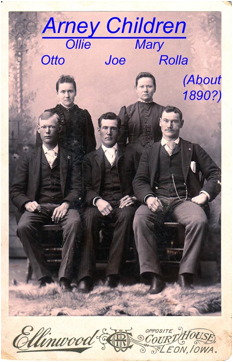 In 1865 Mr. Arney moved with his family to Hancock county, Ill., and in 1868, another move to Decatur county, Iowa. Here they settled four and one half miles north of Leon, and this county has since been their home. Mr. Arney's wife died April 5, 1880. May 5, 1881, he married Mrs. Lucinda Officer. Four sons were born this union, one dying in infancy. Those surviving are - Walter Arney of Madras, Oregon; Alvin and George of Leon, and one step son, Ira B. Officer of Leon. 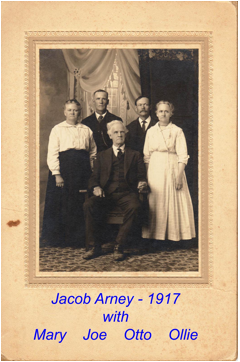 Mr. Arney died at his home in Leon, February 13, 1927, his age attained at death being 87 years 10 months and 20 days. He is survived by his wife, and the children named above, and by 33 grandchildren, 32 great-grandchildren, and 1 great-great-grandchild, one brother, A. N. Arney of Angleton, Texas, and three half brothers, Scott and Joseph Arney of Davis county, Iowa, and J. C. Arney of Montana, and one half sister, Hanna Penrod of Davis county, Iowa also survives. Funeral services were held at the M.E. church Tuesday afternoon at 2 o'clock, conducted by the pastor, Rev J.E. Habliston, interment being in the Franklin cemetery northeast of Leon. Jacob Sylvester Arney (plot 56-6), his first wife Linia (56-7), his second wife Lucinda (56-5), and his son Ira (56-8) are all buried in Franklin Cemetery, Leon, Decatur County, Iowa. Jacob is 21, Ann is 20. They are farming, both were born in Ohio. Jacob S. is 31 and a farmer with real estate worth $1800 and other estate of $380. “Lini A” is 30 and keeping house. Living at home are Mary E. 8, Olive 6, and Joseph 10/12. Also living with them is Ambrose N. (Jacob’s brother) who is age 22 and a school teacher. Jacob is indicated as age 41, widowed, a farmer. There are five children living at home. Mary (our ancestor), age 19, is “Keeping House”. Others are Olive age 16, Joseph age 10, Ira age 9, and Israel age 7. Jacob and his parents were born in Ohio. All the children were born in Iowa. All the children except Mary are marked as having attended school during the census year. Jacob lives next door to son Ira, his wife Cora, and son Wallace (7 months). Jacob’s household has Jacob (61), Lucinda (53), Walter (18), Alvin (16), and George (12). Jacob and Lucinda are still farming, even though he is 71 and she is 63. Lucinda has had 3 children, and all are still living (but none are at home). They own their farm, free of mortgage. Jacob, age 80, and Lucinda, age 73, are living in Leon. They own their home, have no mortgage on it. They say they are able to read and write. Jacob was born in Ohio, his father in N. Carolina, his mother in Ohio. Lucinda was born in Iowa, her father in New Jersey, her mother in Pennsylvania. They can speak English, and have no occupation. The information-about my family, is with the Israel Otto Arney family listing. he never did go by Israel, as he did not like the name. Used to sign his name 1.0. Arney. I am the only survivor or the Otto Arney family, as my twin sister and brother both passed away a year ago, just two weeks apart. Seems kind of funny to be the only one left, af a big family. I always wondered about my Dad's family. Never did meet any of them except Uncle Walter Arney who lived in Beaverton, Oregon, at that time. He came for a visit once but and my family was very poor, and living conditions were not what they were used to, I am sure. That is the only one I ever met, and I was very small at that time but I remember we thought he was great, as he gave my sister and I each a dime before he left. My dad homesteaded in Northern Minnesota in the early 1900's. Worst place on earth he could have gone, as it was all timber. His health was very poor but he did clear 60 acres, and he managed to raise enough grain, to keep his livestock in shape. I had 4 brothers, and they had to leave home and work for room and board, so actually, they were not much help to him. He had to do everything the hard way and then of course the great depression when he lost it all. I am sure he would have lived longer if he had not had so many reversals, and the losing the homestead, just was too much. He did not live long after that. We moved off of the farm in 1938, and he passed away in 1942, at the age of 71. He never did want to be a farmer. He wanted to work as a Depot agent, which would have been much easier for him, health-wise as he always did have a heart problem. But his Dad Jacob Sylvester Arney, told him he would set him up in farming. but would not help him at all if he went into the depot business. Well, he did help, I guess, but he did not understand that country was not farming country. There was not much money in the timber business, either, and I do not remember what they paid a cord, but it was not very much. He never kept very good track of his family, perhaps because of my mother. She was mindful of her own family ties, but not his; and we were known as the "missing link." until it all tied in when my granddaughter decided that I should know something about my family, and went to work on it. All the information I have, she found. It is interesting, and I will continue sending it, by degrees, until you have everything that I have. This is long enough. I am not sorry for my childhood. We had a wonderful time on the farm, and never realized how poor we were, and never thought that we missed anything. Actually, I think we were richer in a lot of ways than a lot of the kids now days. They have everything except a loving family ties. Not all of them, but some of them. I had 3 brothers in the war, and they came home safe and sound. Thank god. Many were not so lucky. My oldest brother had very poor health and could not go to the service. He was very resentful about that. as he wanted to go. There was no work, and so he made what he could by cutting wood and selling, which did not pay much, but he existed. Mother went to work on a WPA sewing project, and bought 5 acres of land [from a friend]. Made payments of $5.00 a month. They built a small house 1 mile south of Bagley, Minn. where it was close enough so she could walk back and forth to work. She had been a school teacher, and she pushed education, but it bothered me that she had to work to keep us kids in school, and I quit when I was in the 10th grade and got married, which lightened the burden at home. against mothers wishes, of course. My sister and one brother did graduate. I had 6 children, and divorced after 31 years and 7 years later I met this wonderful man that I am married to now, for 23 years. He is a wonderful person, and a good provider, which the first one was not either of these things. I pretty much raised my 6 children. Thank god they turned out to be good, useful citizens for which I am very proud. References show her name as Lena, Laney, Linia, Lenae, Linae. Apparently she was commonly called “Linnie”. Linonia A Arney, age 39, is reported as died from cancer in Center Township, Decatur, Iowa. Aunt Geraldine advised that her name was Lucinda OFFICER (her married name).